I worked with the curatorial team to create the interpretation for the permanent displays. 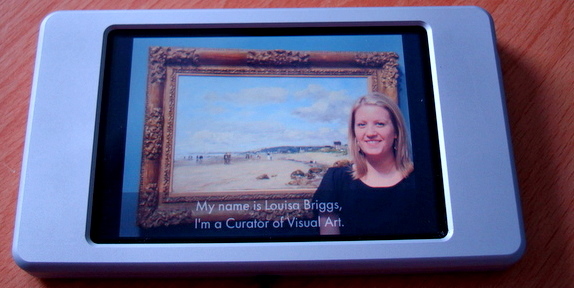 This included gallery text, Find out More booklets, gallery trails and multimedia interpretation. For the latter, I worked closely with the AV Technician and a specialist software developer AP Interactive. New software was created to deliver content through iPod Touch pads. Back of house, we installed an audio recording booth, giving us freedom and flexibility to create our own content. The content was developed with colleagues in curatorial, learning and marketing teams, generating a wide range material from traditional introductions by the curators and poetry readings, to heavy metal tracks and unique soundscapes. Throughout the piloting stages we tested ideas in the gallery with visitors and groups, which proved to be invaluable to the development of the material and to the choice of hardware. I found it interesting and it’s easy to use. Believe me, if I can use it anyone can! I don’t usually listen to these sorts of things at art galleries, but I might do in future as it tells you a lot more than just looking at something. It does feel really liberating to be able to listen to music in art gallery while you’re looking at art. I thought it was great – all this information coming into my head! I enjoy the process of editing text, and the challenges of presenting complex concepts in simple, relevant language. I have experience of developing easy-to-read and engaging gallery trails, object labels, interactive displays, multimedia guides and web resources. I aim to keep the interpretation lively, engaging and accessible, particularly for non-traditional audiences, removing barriers to engagement wherever possible. I love drawing out the quirky details and memorable stories, helping build a personal bridge between the artefact and audience.